Scheduled for release before March 31, 2017, Ghost Recon Wildlands received a new We Are Ghosts trailer today, giving you a look at the environments of the game’s open world. Take down the cartel, become a ghost and explore Bolivia. A few years from now, Bolivia has become the largest cocaine producer in the world. As a Ghost, you must stop the cartel by any means necessary. Create and fully customize your Ghost, weapons, and gear. Lead your team and take down the cartel, either solo or with up to three friends. Includes the Standard Edition and the digital Deluxe Pack which includes: the Huntsman rifle and motorbike, three emblems, three weapon camo, three character customization items and a XP booster. Includes the Deluxe pack and Seasons Pass content, giving players access to two major expansions as well as exclusive digital content featuring equipment packs, an exclusive vehicle and epic weapons. 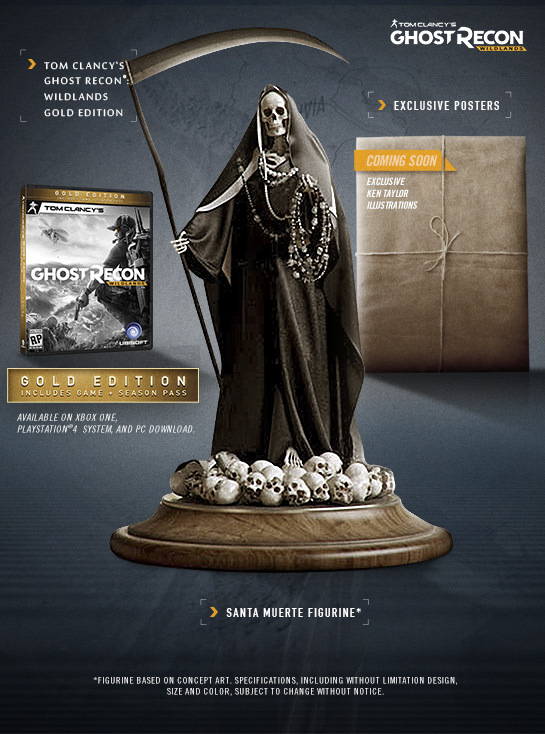 Standard available for $119.99, Deluxe available for $129.99 and Gold available for $159.99 – Includes the edition of your choice with a Santa Muerte figurine and collectible posters designed by Ken Taylor. By pre-ordering any edition of Ghost Recon Wildlands, you’ll receive The Peruvian Connection bonus mission that takes you to the high mountains of Bolivia. More information about Ghost Recon Wildlands will be revealed at E3 2016, likely during Ubisoft’s press conference.